If you're like me, you probably never gave much thought to your mattress—other than making sure it's firm and comfortable. Well, if you're chemically sensitive or at all concerned about your health, you should read my article, "Nocturnal Emissions," in the current (March/April) issue of Mother Jones. A note about PBDEs, the flame retardant chemicals that cause liver, thyroid, and nervous system toxicity. In 2004, the European Union banned penta- and octaBDE (used in personal computers and small appliances), a step the EPA has so far refused to take—largely because U.S. government and regulatory agencies require proof that a product is dangerous before pulling it, whereas in Europe, manufacturers bear the burden of proving that a product is safe. (The EPA does require manufacturers to notify it if they plan to use either penta- or octaBDE, and the sole U.S. manufacturer of these chemicals phased out production in 2004.) However, two states have followed the EU’s lead, banning the sale of products containing these two PBDEs—Maine (in 2005) and California (in June 2006). From the 1980's until the end of 2004, though, pentaBDE was the main flame retardant chemical used on polyurethane foam. 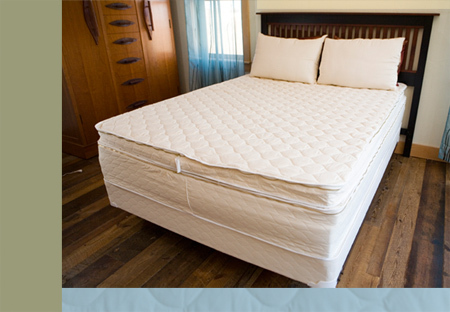 Whether or not PBDEs were used in mattresses is a controversial issue. While anti-PBDE activists and green mattress advocates contend that mattresses made in this country before 2004 likely contain PBDEs, Luedecka of the Polyurethane Foam Association says that untreated polyurethane foam itself is resistant to smoldering ignition—so mattress companies would not have had any reason to treat their foam with fire resistant chemicals. “Polyurethane foam itself is an efficient thermoplastic—meaning without fire retardants it shrinks and retreats from a radiant heat source,” says Luedecka. In other words, mattresses made of polyurethane foam would’ve passed the federal smoldering test with flying colors. However, Luedecka admits that there were requests from mattress companies that insisted their foam be fire resistant in order to meet California’s open flame regulation for furniture, TB 117. (Passed in 1975, this standard required that all furniture sold in California pass an open flame test; though mattresses weren’t included in this proviso until 2005, some companies, according to Luedecka, still asked that their mattresses comply.) Ironically, then, California—known for its environmental leadership—unwittingly encouraged the use of PBDEs when it adopted this stringent legislation. I'll leave you with this quote, from Michael Penny, owner of the Virginia-based organic mattress company Savvy Rest.